What is she really thinking? The Princess of Pentacles is an earth occultist, an expert on the mysteries of the earth. She may be a witch or a sorceress. Or she may simply be a very mysterious person who always seems to know things. Her serenity hides an impenetrable depth, hidden worlds of ancient knowledge only the chosen can touch. 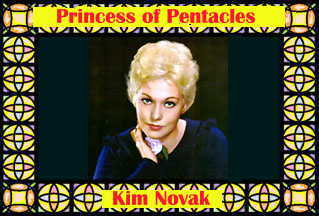 Kim was hidden away at the Kim Novak Gallery.